Rocket Matter 10 Minute Law Firm Podcast, March 5, 2019, Episode 64: “Hiring and Onboarding Best Practices” with Rocket Matter CEO Larry Port. Your ABA, December 2018: Key takeaways were shared from my article in the July/August 2018 issue of Law Practice. 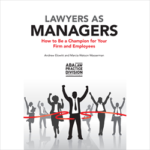 Berbay Marketing & Public Relations, Law Firm Marketing Catalyst Podcast, “Why Good Management Matters: 5 Traits of Champion Managers,” September 5, 2018. Blog by Sharon Berman, Berbay Marketing & Public Relations on my September 6, 2018 podcast, see above. State Bar of Michigan: On Balance Podcast “Managing your Firm Like a Champion,” May 29, 2018. State Bar of Michigan: On Balance Podcast Legal Talk Network, Andrew Elowitt’s interview on my work in “Managing Your Firm Like a Champion,” June 12, 2018. Your ABA: “Why Good Management Matters,” March 2018. San Fernando Valley Business Journal: “Lawyers Learn People Skills,” by Helen Floersh, November 13, 2017. LAW360: “5 Tips for Getting the Most Out of Your Firm Retreat,” by Kali Hays, July 18, 2016. Law Office Administrator: “Good and Practical Ways to Cut the Expenses and Build the Revenues,” by Bill Kimbro, February 2012. Law Office Administrator: “Why Are You Leaving?” by Bill Kimbro, September 2011. Marcia is available to provide expert commentary for newspapers, magazines, radio and television. Please contact Marcia at: mwasserman@comprehensivemgmt.com or call her at: 818.885.9080.